Tangled and True: make your own popsicles. I love the idea of making popsicles with my kids. I can control what goes into them, and spend time doing something that makes the girls happy. In the end we have a cool treat and happy kids! This recipe sounds amazing and I'm hoping to put it together this week. 1. In a blender or food processor, puree the yogurt with 1 Tbsp of the lime juice until smooth. Transfer mixture to a bowl. 2. In the blender or food processor (no need to clean), puree the raspberries with the remaining lime juice and sugar. Pass the puree through a fine sieve to remove the seeds; you should have about 1/2 cup. 3. 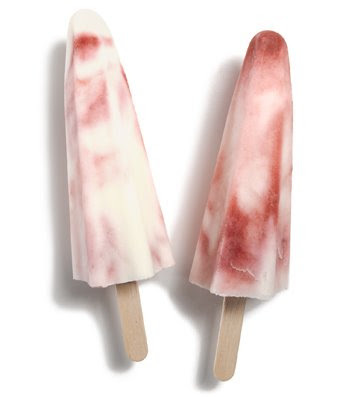 Pour the yogurt mixture and the berry puree in layers in 4 large popsicle molds or 8-ounce cups. Using a wooden popsicle stick, swirl the layers together. Insert sticks, then freeze the pops for at least 6 hours, or until they're solid. 4. To unmold the pop: Run warm water over the bottom three-quarters of the mold. Let it stand for 10 seconds then gently pull out the pop. Serve immediately or wrap each pop individually in plastic wrap and freeze until ready to serve. The popsicles will keep, wrapped and frozen, for at least one week.